The island of Sakhalin is the 948km-long heart of the Sakhalinskaya Oblast (Sakhalin Region) which includes the disputed Kuril Islands and more than 50 smaller islands. Japan has long claimed the Kurils but since World War II they have come under the Russian rule. Travellers find getting around the region somewhat costly and difficult, but for those who make the effort there is a great deal of natural beauty to admire with three-quarters of Sakhalin covered in forests and mountains. The name Sakhalin is derived from Sahaliyan, which means ‘black’ in Manchu. Viewed from space, the shape of the island is said to resemble a fish, with its many rivers and lakes likened to fish scales. Being seven time zones from Moscow makes Sakhalin locals feel quite separate from the capital of the Russian Federation and complain that about 95% of all their revenue goes there. It is a regular grumble that the gas sourced in the Sakhalin region is sent to Komsomolsk and Khabarovsk by pipeline and then sold back to the island at inflated prices. Russians who have moved to Sakhalin from the west of the country complain that life is more costly than back in Moscow and St Petersburg. Despite this, most Sakhalin inhabitants, including the descendants of the Korean workers forcibly taken there as virtual ‘slave labourers’ by the Japanese during World War II, are politically ultra conservative. Yuzhno-Sakhalinsk is the booming capital of the region, which is fuelled by the oil and gas industry. The landlocked city which sprawls between two mountain ranges benefits from the high spending business visitors who pass through en route to the rigs or large construction projects. The intriguing Sea of Okhotsk is frozen for much of the year. Explore with us on this expedition and learn about an area rich in history, see seabirds in spectacular numbers, including the majestic Steller's Sea Eagle, admire seals and much more. Sakhalin is Russia’s largest island at 948km (589 miles) in length and 25 to 170km (16 to 106 miles) wide, with an area of 72,492 sq km (or 27,989 sq miles). Sakhalin Island is separated from the mainland by the narrow and shallow Strait of Tartary, which often freezes over at its narrowest points in winter. It is also very close to Hokkaidō in Japan across the Soya or La Pérouse Strait. There is some debate about the origin of Sakhalin Island, but the dominant theory is that this geological feature rose up from the Sakhalin Island arc. As much as two-thirds of Sakhalin is mountainous. Two parallel ranges of mountains with peaks reaching 600–1,500m (2,000–5,000 feet) traverse it from north to south. The highest peak in the Western Sakhalin Mountains is Mount Ichara at 1,481m (4,859 ft), while the highest peak of the Eastern Sakhalin Mountains and on Sakhalin Island is Mount Lopatin at 1,609m (5,279 ft). The two mountain ranges are separated by the Tym-Poronaiskaya Valley. The Susuanaisky and Tonino-Anivsky ranges traverse the island in the south, while the north of Sakhalin Island is predominantly taken up by the swampy Northern-Sakhalin plain. Cretaceous limestones which contain abundant and specific fauna of gigantic ammonites occur at Dui on the west coast while crystalline rocks crop out at several capes. Tertiary conglomerates, sandstones, marls and clays, folded by subsequent upheavals, are found in many parts of the island. The clays contain layers of good coal and an abundant fossil vegetation, indicating that during the Miocene period Sakhalin formed part of a continent which comprised north Asia, Alaska and Japan, and enjoyed a comparatively warm climate. The Pliocene deposits contain a mollusc fauna more Arctic than that which exists today, indicating that the connection between the Pacific and Arctic Oceans was probably broader than it is now. The Tym River is 330km (205 miles) long and navigable by rafts and small boats for 80km (50 miles). It has numerous rapids and flows north to north-east to the Sea of Okhotsk. The Poronai River flows south to south-east to the Gulf of Patience on the south-east coast. Three other small streams enter the wide semicircular Gulf of Aniva at the southern extremity of the island. Lying close to Sakalin Island, just southwest of Kholmsk, is the small unpopulated island of Moneron which is popular with divers, snorkellers, and bird watchers. It became Russia's first marine park because of the abundance of underwater wildlife with even some subtropical species and fantastic plants. These have come about due to an array of underwater reliefs and the warm Tsusimskoye current. Above the water the scenery is quite dramatic and features interesting rock formations, waterfalls, rocky canyons and alpine meadows. 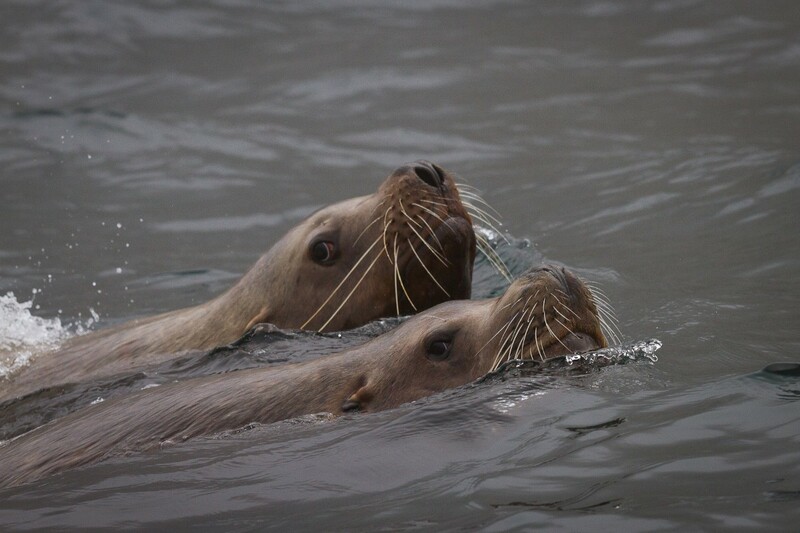 The island has numerous bird colonies and is a breeding ground for sea lions. Tiny Tyuleniy (Seal) Island has one of the largest Northern Fur Seal and Sea Lion rookeries in the world, so the island is aptly named. There is a small Russian research station on the island, with blinds for observing the wildlife including many bird species. Lake Tunaycha, the largest body of fresh water on the island, is 45km south-east of Yuzhno-Sakhalinsk. It is one of a string of shallow lakes running along Sakhalin's western coast line which are host to a number of wading bird species. The Vaida mountain range is part of Smirnych Nature Reserve, which cuts the island in two at what used to be the division between Japanese and Russian Sakhalin. The area has seen some fierce fighting over sovereignty disputes but these days it is more peaceful although heavy deforestation has taken its toll on unprotected forests. This area boasts some spectacular caves (particularly the Vaida Cave) with impressive stalactites, stalagmites and petroglyphs. Various artefacts have also been found in the caves. The scenery above ground is also spectacular with many alpine plants and some pretty lakes dotted here and there for good measure. Zhdanko Ridge was created by molten magma rising through cracks but not allowed to surface through the crust. Wind and water eventually caused the collapse of this ridge north of Tikhaya village. The 13km long, 1-2km wide streak of solidified magma is now the main feature of a protected state territory where unusual volcanic rock formations, hardened lava flows, sudden 30m vertical drops and many beautiful waterfalls, up to 50m high can be seen. In spring the dark volcanic rocks contrast the light-green grass and trees, providing some beautiful vistas. The indigenous people of Sakhalin are the Nivkhs, Oroki and Ainu minorities. Ivan Moskvitin and Martin Gerritz de Vries were the first Europeans to explore the waters around Sakhalin Island in the mid 1600’s. They were followed by Jean-François de La Pérouse in 1787 and Adam Johann von Krusenstern in 1805. Early maps issued as a result of these visits show Sakhalin Island attached to the Asian continent. It was first depicted as an island in 1809 by Mamiya Rinzō and this was later confirmed by Russian navigator Gennady Nevelskoy in 1849. During the Ming and Qing dynasties, China considered the island part of its empire and included the Sakhalin peoples in its "system for subjugated peoples". At no time however was there any attempt to establish an imperial military presence on the island. Japanese settlement on Sakhalin dates from the establishment of Ōtomari in 1679. Concerned about Russian expansion in northeast Asia, Japan proclaimed sovereignty over the whole island in 1845, but Russian the settlers ignored this claim (and the claim from China). By the early 1850’s they had established coal mines, administration facilities, schools, prisons, churches on the island. Russia and Japan signed the Treaty of Shimoda in 1855 which declared that Russians could inhabit the north and Japanese the south, without a clear boundary between them. In this accord Russia also agreed to dismantle its military base at Otomari. Following the Opium War, Russia forced the Qing to sign the Treaty of Aigun and Convention of Peking, ceding all China’s territories north of Heilongjiang (Amur) and east of Ussuri, including Sakhalin, to Russia. A Czarist penal colony was established in 1857, but the southern part of the island was held by the Japanese until the 1875 Treaty of Saint Petersburg (1875), when they ceded it to Russia in exchange for the Kuril Islands. After the Russo-Japanese War, Russia and Japan signed the Treaty of Portsmouth in 1905 under which the southern part of the island below 50° N passed to Japan with the Russians retaining the other three-fifths of the area. In this era South Sakhalin was called Karafuto-chō by the Japanese and they called the capital Toyohara. This is the city we now know as Yuzhno-Sakhalinsk. About a month before the surrender of Japan in World War 2, the Soviets attacked South Sakhalin on 11 August 1945. Strong Japanese resistance slowed the Red Army advance despite the fact that they were outnumbered by three to one. Once reinforcements arrived however the Soviets broke the Japanese defence line and by 25 August 1945 they had occupied the capital Toyohara. Japanese sources claim that 20,000 civilians were killed during the invasion. The Sakhalin Oblast in its present form was officially integrated into Russia on 2 January 1946. At that point most of the Japanese who had been living there were repatriated to Japan. Many resident Koreans however were refused repatriation and have since lived under Russian rule. Their descendants have since become known as the Sakhalin Koreans. Japan renounced its claim over southern Sakhalin in the 1952 Treaty of San Francisco. However the treaty did not explicitly approve Russian sovereignty over the area and to this day it is marked as ‘No Man's Land’ on Japanese maps. Nevertheless, Japan does retain a Consulate-General in Yuzhno-Sakhalin. The status of the Kuril Islands is still in dispute and with no official treaty arrived at between the two nations the issue remains a major strain on Japanese-Russian relations. When the closely monitored airspace over the region was breached on 1 September 1983 the Soviets downed Korean Airlines Flight 007 which was carrying 269 passengers, including US Congressman Larry McDonald, west of Sakhalin Island. The Politburo accused the aircraft of spying and the incident created a significant escalation of the Cold War. On the 28th of May 1995 a magnitude 7.1 earthquake struck near the town of Neftegorsk in northern Sakhalin, killing nearly 2,000 of the 3,000 residents. The city of Yuzhno-Sakhalinsk originated as the village of Vladimirovka in 1882 and came under Japanese control at the end of the Russo-Japanese war. The Japanese renamed the city Toyohara and made it the capital of the Japanese prefecture Karafuto which occupied the southern half of the island. At the end of World War II the Soviet army regained the city and it became Yuzhno-Sakhalinsk when control was transferred back to Russia. Little remains of the Japanese administration apart from a few old buildings including the impressive old government offices which now house the regional museum. The enduring indication of Japanese occupation is the large number of Sakhalin-Koreans. These are descendants of people banished here by the Japanese in the 1930’s. Denied repatriation until the mid 1980’s, many decided to stay on Sakhalin and around 20,000 now reside in Yuzhno-Sakhalinsk. Main points of interest in the city include the Chekhov Literary and Art Museum and the Sakhalin Regional Museum. Sakhalin Island is predominantly covered in dense, mostly coniferous forests. The Yezo (or Yeddo) spruce (Picea jezoensis), the Sakhalin Fir (Abies sachalinensis) and the Dahurian Larch (Larix gmelinii) are the most common trees. On the upper slopes of the mountains are the Siberian Dwarf Pine (Pinus pumila) and the Kurile Bamboo (Sasa kurilensis). Siberian Silver Birch (Betula platyphylla) and Erman's Birch (B. ermanii), Poplar, Elm, Bird Cherry (Prunus padus), Japanese Yew (Taxus cuspidata) and several willows are mixed with the conifers. Further south the Maple, Rowan, Oak, the Amur Cork Tree (Phellodendron amurense) and the Spindle (Euonymus macropterus) are in evidence. The undergrowth abounds in berry-bearing plants such as Cloudberry, Cranberry, Crowberry and Red Whortleberry as well as Red-berried Elder (Sambucus racemosa), Wild Raspberry and Spiraea. 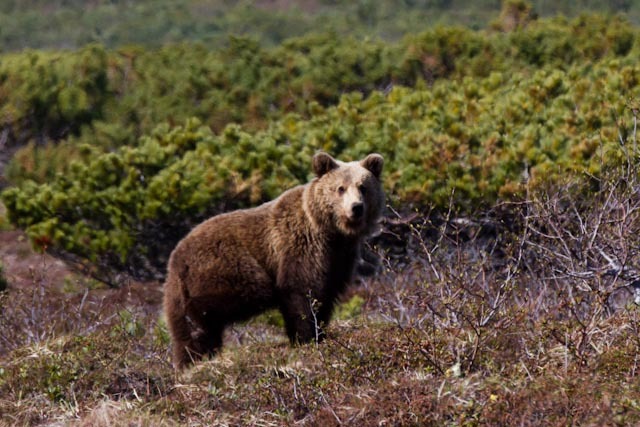 Brown bears, foxes, Sea Otters and sables are seen on Sakhalin Island, with some reindeer in the north. Musk Deer, hares, squirrels, rats and mice are also found all over the island. There are some endemic or near-endemic bird species, notably the endangered Nordmann's Greenshank (Tringa guttifer) and the Sakhalin Leaf Warbler (Phylloscopus borealoides). The rivers swarm with salmon (Oncorhynchus) and other fish. Numerous whales visit the sea coast, including the critically endangered Western Pacific Gray Whale, for which the coast of Sakhalin is the only known feeding ground. Other endangered whale species known to occur in this area are the North Pacific Right Whale, the Bowhead and the distinctive white Beluga Whale.